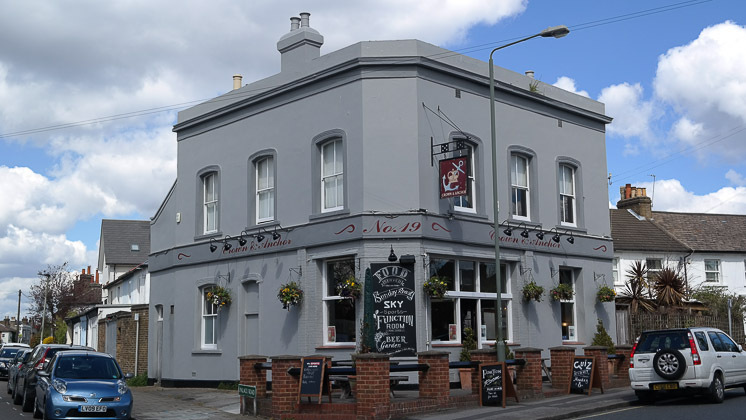 The Crown and Anchor had been on my list for a little while now, being quite close to our house and also Bromley Town Centre (we also had a Jo Jingles Christmas class a few years ago there). So, when we were at a loose end one Sunday, I decided to give them a call. I made the booking the same morning – 12:45pm for 3 people (Claire, me and our toddler, JW). Parking on a Sunday was simple – there were lots of spaces available on the road (it can get busy though). Upon walking through, we were greeted at the bar and shown to our table in the conservatory. It was incredibly hot (and bright), but thankfully the sun went behind the clouds for most of our meal, and we managed to get a door open to let the air circulate – I would not like to be in it during the 3 hot days of Summer. Our table was laid out with paper napkins and cutlery. There was also some flowers on the table, along with unlit candle. The conservatory was nicely decorated, a modern take on traditional things – such as a ladder hanging from ceiling with various items hanging off. There was some music playing over the speakers, drowning out the sport showing on the TV in the main pub area. Whilst a full pub affair, we decided on 2 diet cokes for drinks. We skipped starters and went straight to main sources. We ordered a (gluten, wheat and dairy free) roast beef for JW, a roast chicken for Claire and I asked for the lamb. Service was quick – our lunch came out within 10-15 minutes of ordering. I had 3 large slices of lamb, 4/5 roast potatoes, parsnip, broccoli, a swede/carrot puree and a large Yorkshire pudding. And, what’s this? – CAULIFLOWER CHEESE! Also, they brought out two jugs of gravy, one for Claire and I, one specifically for JW (so – gluten, wheat and dairy free). 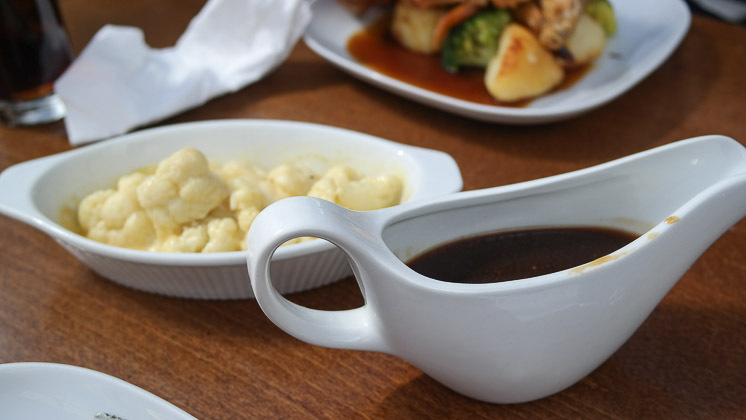 A really nice touch, JW being able to have his own gravy jug. Tucking in, the lamb was good – lots of it. Claire’s chicken was H-U-G-E, with lots of lovely seasoning. It was very moist, with lovely seasoning. JW’s roast beef was really tender – he ate all of it. The roast potatoes were not as crispy as we had hoped, but the parsnip was amazing – probably the best Claire has EVER had! Delicious cauliflower cheese and lovely gravy with really deep flavours. We ordered JW an off-menu fruit salad – consisted of lots of strawberries, orange segments, melon and grapes. My strawberry cheesecake was well presented – it had a very hard biscuit base, lots of strawberries with coulis, cream and then mascarpone on top. A really nice, modern cheesecake. There wasn’t anything special for children, but were able to offer a smaller Sunday lunch for JW. We appreciated the extra gravy, just for him. I do not believe they had baby changing facilities. They did have a garden, but this was out of bounds when we visited. 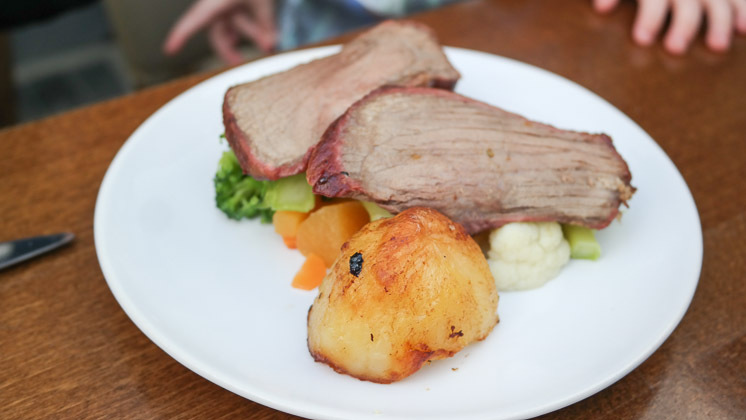 We felt ok bringing JW to The Crown and Anchor, and it is suitable for families. 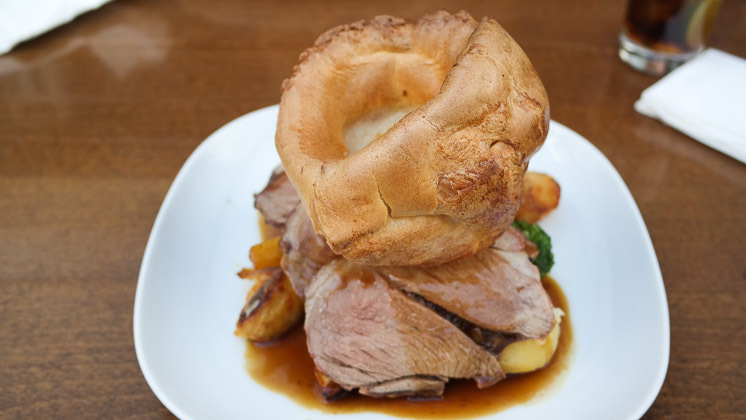 Sunday lunch at The Crown and Anchor was a very good local roast. The service was friendly, the conservatory was fresh and clean – I do have some reservations about eating during the extremes of British weather (either too hot or too cold). 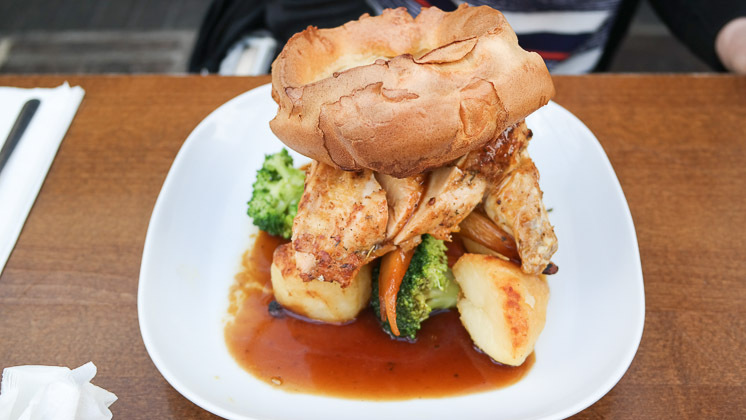 The Sunday lunch was very good – excellent cauliflower cheese, delicious meats, vegetables, Yorkshire pudding and gravy. I also appreciated a bit of originality with the cheesecake. So, a very worthy Recommended Award for Sunday lunch at The Crown and Anchor in Bromley – 4/5. Suitable for casual and family Sunday lunches.